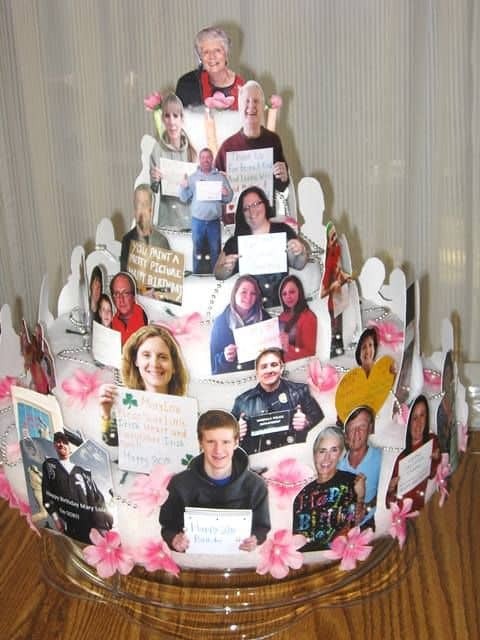 I love using picture centerpieces as table decorations for any major celebration - a birthday, wedding or anniversary party.. It’s so much fun to see how much the people have changed over the years. 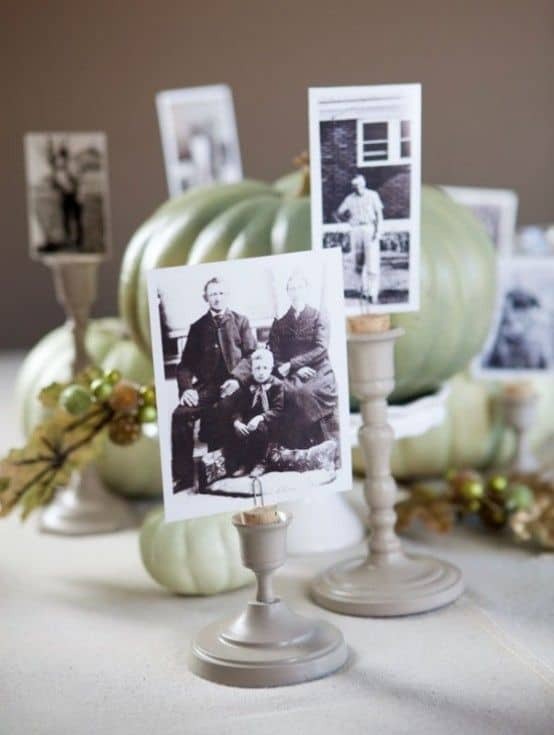 I’ve found some amazing (and easy) ways to incorporate photos as centerpieces. They’re great to use whether you’re having a party or a dinner. I love the look of these photo frames! You can buy inexpensive frames from Michael’s or Ikea – if you’d like, you can spray-paint them to match your color scheme. The pictures themselves are printed on vellum paper, which can also be bought at your local craft store. Tape the frames together, add a tea light, and you’ve got a lovely centerpiece. You can find the complete directions here. These could be done to match any color scheme! 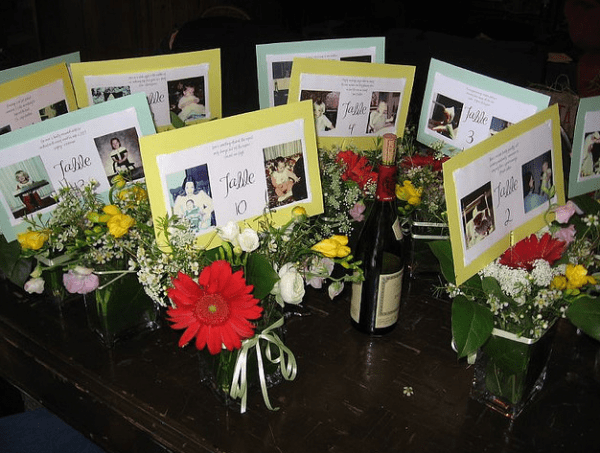 Just print your photos out on stock paper in your favorite color and add them to your flower arrangements. I found this charming decoration on Pinterest. These would be great table centerpieces using photos for a casual dinner or party. Unfortunately, there aren’t any instructions, but this looks pretty straight forward. 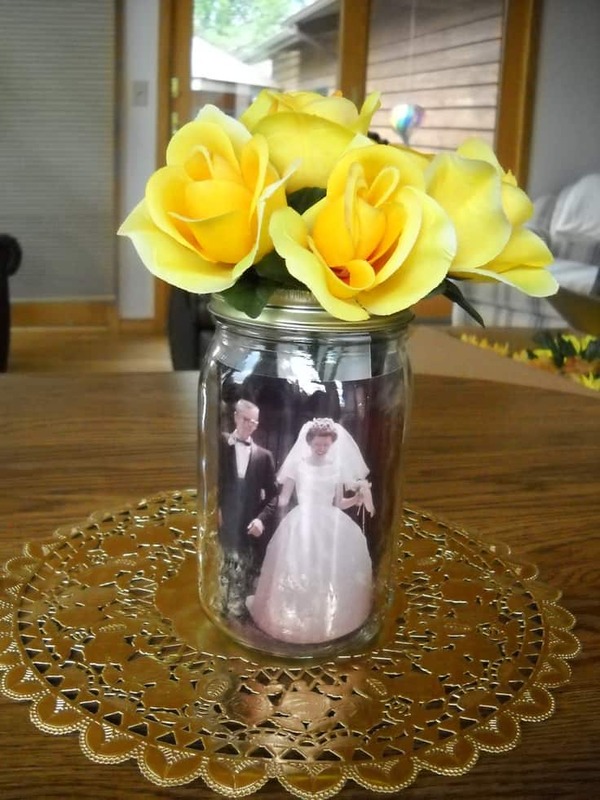 Just add your favorite photos to mason jars. 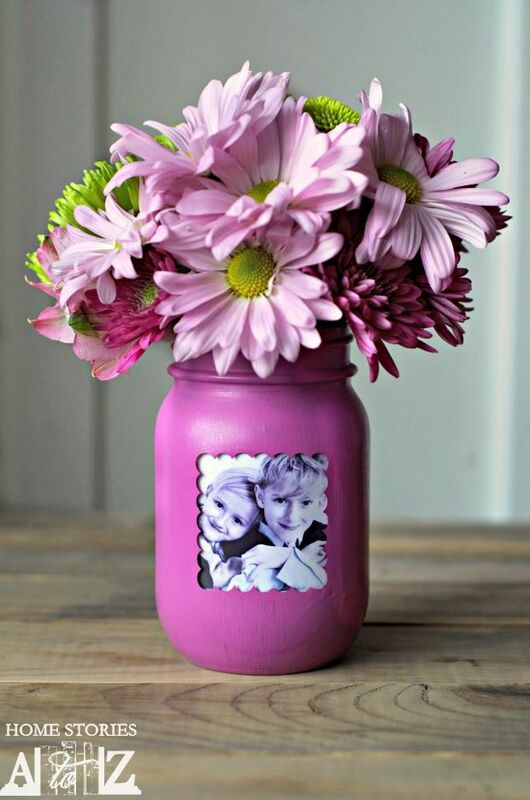 They added silk flowers, but I think if you wanted to use real flowers you would just need to put an inner container inside the mason jar to keep the pictures from getting wet. Hatboxes make beautiful decorations for a woman’s party, and they’re actually easy to find at craft stores such as Michaels or Hobby Lobby. Choose boxes of different heights and coordinating colors to add interest. I love how they added pictures in different styles of frames. You could even tape pictures directly onto the hat boxes if you’d like. 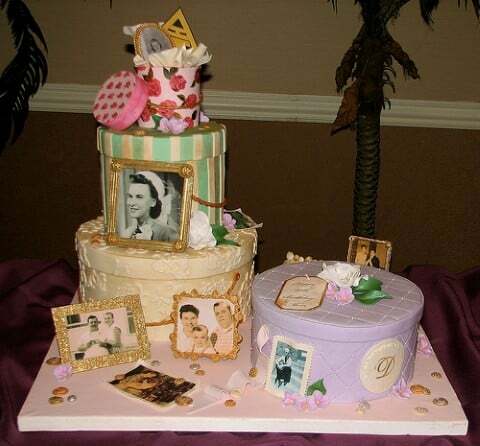 You can see this and more 80th birthday ideas at Birthday Owner. This beautiful cake-like decoration is truly a labor of love, but is something that the guest of honor will surely treasure! Get the details of this charming decoration here. Here’s another cute – and easy – way to display photos on the table. Just add a wine cork to a candlestick holder, and insert a paper clip to hold the picture. Another fun find on Pinterest! What a charming idea for a tea party! 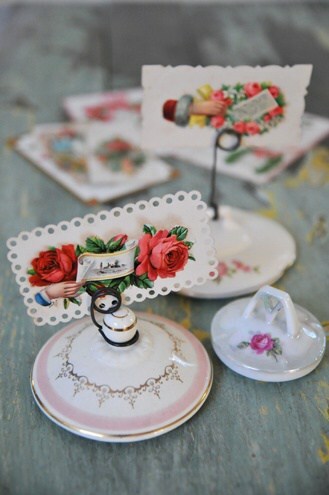 She’s repurposing old tea cup lids as name tag holders, but I think these would be adorable as photo holders as well. Just twist wire (I’d probably look for white wire to blend in a bit more) around the handle and add a photo. Check flea markets or maybe eBay for vintage tea pots. 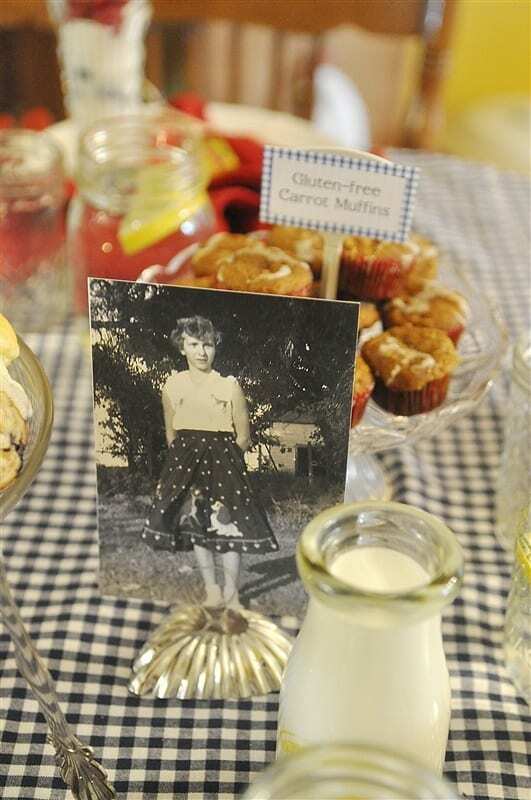 What a great idea – using place cards to hold pictures! 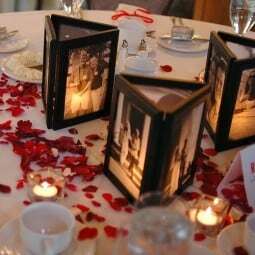 Place card holders are inexpensive and easy to find in so many styles…and how simple to use. Be sure to put 2 photos back-to-back in the place card so that your guests will enjoy a delightful view no matter where they’re sitting. These lovely mason jar photo vases would be a fun little DIY project that is sure to steal the spotlight at your party. Use any color you’d like to match your color scheme. Add a battery-operated tea light to the bottom for a special effect.